Congratulations to Janet Trim – this week’s lucky winner. You have until Friday, Nov 23 at midnight to enter to win. Boy this would be a nice Christmas gift to myself. I can see so many uses for this. Not only to get my craft room organized and everything labrled, but for crafting too. Would be awedome to make one-of-a-kind ribbon for my crafts. Thsnk you to both CS and Brother for the chance to win. Happy Thsnksgiving! Already subscribed. I’ve got a Brother Label maker on my wish list. I think my family is worried I would go hog wild labeling everything including them…lol. Thank you for the chance to win! What a wonderful Christmas present this would be! Thanks for the opportunity Brother and CS. How fun is printing on ribbon. Love this little machine, thanks for the chance to win! Done! I’ve had my eye on this fun little machine and it’s on my Santa list! Done…….What a super surprise to win this awesome labeller from Brother……would be just like Christmas. Ho Ho. Thanks for the chance…. This would be awesome to win! Thanks for the opportunity. DONE. Thanks for the chance to win this awesome prize. Done! What a cool toy! Done would love to own!!!! Do you have to be from Canada to enter? No Jeanne – the contest is open world wide! Good Luck! Done! I love making tags and labels and this is a perfect gift to put on my wish list. Thank you for this neat prize! Would certainly add to my scrapbooking! You gals are amazing! Who won’t want to win? What a great idea to personalize ribbon. Done! What a great prize! Would be a great birthday present to me on the 23rd!!! Thanks for the chance! Done! Thank you for the opportunity to win such an awesome prize! Done! Looks like a fun tool. I’d love to win this! I subscribed to the Brother newsletter. Done. Already on the Brother email list! Thanks for the chance to win! Done! I know that if I’m not the lucky one, the one that does win will be most grateful. Good luck everyone! Love crafting so this would be a great addition! Would love to have! Would love this….so many things to label! Done. Writing on ribbon is a fantastic idea! Done! So cool, I didn’t know it could print on ribbon. Would love to win! Done. Ooh, the possibilities are endless! 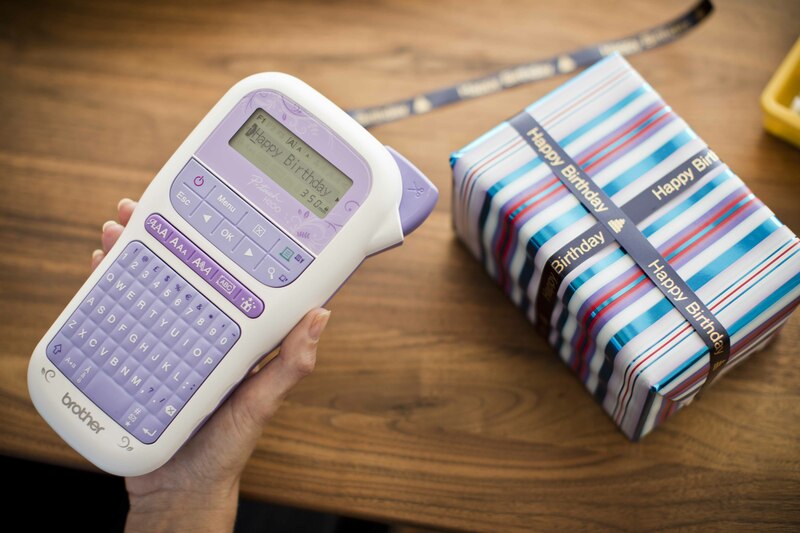 I would love to win this label maker! I am already a subscriber to the Brother newsletter so “DONE”! Wow what a great prize!! Done. Done! I didn’t know you could print on ribbon, how fun! Done….. Great Labeler…… So much I can do with this…… Making a son’s scrapbook. Thanks for the opportunity. Great giveaway!! OMGosh so neat. My girls would have so much fun labeling EVERYTHING!!!!! LOL. This is such a fun machine! Every time I see this little device it appeals to me more! I would love this!There is so many times I have wished I could journal with strip labeling.I love ge lolo of it and the convenience is amazing!! Done! Thanks so much for the chance to win! The thought of being able to print on ribbon has sent my creative brain in to overdrive! Oh my, what a wonderful prize this would be to win! Would definitely help me when organizing my craft drawers and grocery pantry for sure! Love the pretty purple colour~!! Done! Love it. So many uses for this craft labeller! Thanks for the chance! Done! Who doesn’t love a label maker?! That would come in so handy! I am eagerly awaiting your next issue. Thanks for all the wonderful gifts. I’ve been wanting one of these for a long time but other things came first 🙂 Thanks for the chance to win one! Squweee!!!! A label maker!!!! Nice! Thank you Brother and CSM!! Awesome prize, thanks for the opportunity to win! This has been on my wish list for quite a while! Thanks for the chance to win! Too cute! I would love to win this label maker. Thank you for sponsoring this great giveaway. Done. Perfect gift for getting organized and labeling everything in sight!! What a great prize to win before Christmas! Thanks Brother and CSM! Done! Thanks for a chance! Why not me? Love to win. So happy to be entered and DONE! Done. I would love to win this. Thanks for the chance. Done!!! This would be a wonderful tool to have ! for something. thanks for the chance. Subscribed already to Brother. Would LOVE to win this! I am not really sure how to use this Brother Ptouch Crafting Labeller! However, I am very curious to learn all it has to offer! It is one of those “toys” as I refer to many of my “wants” when it comes to craft room tools, that I am sure I would find a million and one uses for. Would love to add it to my “toy box”! Thanks so much for a chance to win this handy dandy labeller. I would love to be able to print a personalized ribbon for gifts and cards. Hope everyone has a wonderful weekend. Thanks so much for a chance to win this handy dandy labeller. I would love to be able to print a personalized ribbon for gifts and cards. Printing on ribbon??!! So neat!!! Done. Thanks for all the great give a ways! Wow – this would be a wonderful addition to my tool collection! Thank you for another amazing opportunity! Done! Would be such a cool prize to win!!! Done😊 Merry Christmas to me fingers crossed!Love that Funky label maker ! Done! What a great prize! Sure could use this Brother Ptouch Crafting Labeller in my crafting. So many great uses fot his tool. A labeler would be great for messages on ribbon or use in scrapbook layouts! This is a nice prize! I would love to have this labeling gadget for all of my crafty and household needs! This would be great to help with organizing my craft room. Thanks for the chance to win it. DONE!